SAN FRANCISCO, November 15, 2018 - ​Periscope Data, the world’s leading analytics platform for data professionals, today announced it ranked No. 4 on Deloitte’s Technology Fast 500™, a ranking of the 500 fastest-growing technology, media, telecommunications, life sciences and energy tech companies in North America. Periscope Data has grown more than 23,000 percent in the last three years. Periscope Data’s co-founder and CEO Harry Glaser credits the continued success of the company with the increased adoption of companies utilizing data to take actionable insights to drive their businesses growth. Companies of all sizes are adopting more aggressive data strategies and, for the first time in history, formalizing data teams within their organizations to drive their business decisions, which in turn has helped to fuel dramatic growth for Periscope Data. As the company expands to add more companies to its client roster, it has seen its average new deal size increase by more than 80 percent year over year. Today, Periscope Data’s customers include large Fortune 500 companies and smaller startups alike, all of whom utilize Periscope Data's platform to turn deep data insights into action with the speed, power and flexibility they need to gain a competitive advantage. For more information about Periscope Data or to sign up for a free trial, visit periscopedata.com. 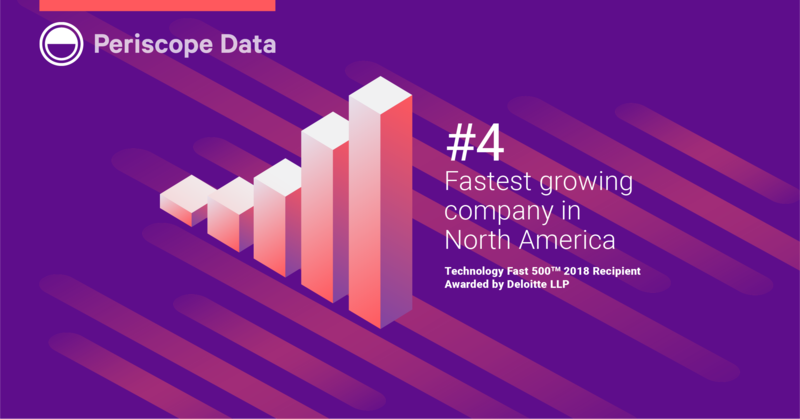 Deloitte’s Technology Fast 500 provides a ranking of the fastest-growing technology, media, telecommunications, life sciences and energy tech companies — both public and private — in North America. Technology Fast 500 award winners are selected based on percentage fiscal year revenue growth from 2014 to 2017. In order to be eligible for Technology Fast 500 recognition, companies must own proprietary intellectual property or technology that is sold to customers in products that contribute to a majority of the company's operating revenues. Companies must have base-year operating revenues of at least $50,000 USD and current-year operating revenues of at least $5 million USD. Additionally, companies must be in business for a minimum of four years and be headquartered within North America. Periscope Data delivers the fastest time to insight, with the most power and the greatest flexibility of any BI software. Data experts and line-of-business professionals use Periscope Data every day to ingest, store, analyze, visualize and report on data — all from a single connected platform. Periscope Data is trusted by more than 1,000 customers, including Adobe, Crunchbase, EY, HBO and ZipRecruiter.